By Cory Lenz, Reference and Instructional Services Librarian. 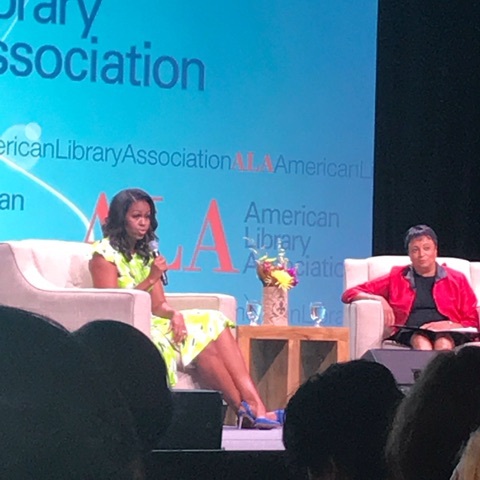 Michelle Obama recently spoke at the American Library Association (ALA) conference in New Orleans, Louisiana. 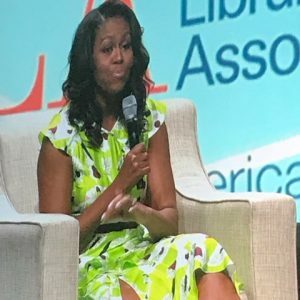 She headlined the General Opening Session to promote her new book Becoming from Crown publishing, which will be released on November 13, 2018. In this deeply felt memoir, Ms. Obama reflects on the influences and life events that helped her become a successful wife, mother, lawyer, author, advocate, and First Lady of the United States, and in its telling inspires others (particularly girls and young women) to become their most thoughtful and compassionate and best selves. In her new book Becoming, Michelle Obama takes pride in the “ordinariness of [her] extraordinary story” and hopes it inspires other girls and young women on their journeys to becoming nurturing life partners, caregivers, professionals, advocates, and people.